April is finally here and Major League Baseball’s season opener was this past week! If you follow me on Instagram you know we are a softball family, and our love of the game extends all the way to our Bay Area major league franchise, the Oakland Athletics. The Oakland Athletics (affectionally known as the "A’s” ) kicked off their season this week, and with it came a huge milestone for the franchise. This is their FIFTIETH season in Oakland. The Athletics are actually one of the American League’s original charter teams (originally the Philadelphia Althetics) but moved to Oakland in 1968 where they have been ever since. That means that for the past 50 years Oakland has been able to call the Athletics “our” team! In a major metropolitan area, there are often multiple major league sports teams, and in the Bay Area has no shortage.. but the Oakland Athletics are special. They have ALWAYS focused on being Oakland's home team. Not the Bay Area, not San Francisco, not Northern California.. ONLY Oakland and the East Bay. They have continuously celebrated the people in their home city and are always improving on the experience of attending A’s games in Oakland. As residents of the East Bay we have always been A’s fans, and attend games every season. So when the A’s invited our family to a recent game which celebrated the top 50 players in Oakland A’s history (voted on by the fans of course!) we were super excited to attend. I grew up with players likeRollie Fingers (and his iconic handlebar mustache), Mark MacGuire (and his thundering bat), Rickey Henderson (the stolen base superstar) and Reggie Jackson. These were baseball icons! It was so cool to see these guys on the field again. And I cannot leave out Jose Canseco. As a kid I played softball with a Jose Canseco signed glove! I had totally forgotten about it until I heard his name thundering throughout the stadium. Seeing him on the field again brought back a wave of nostalgia. We have always loved attending games. The kids enjoy it (both the game and the food) my husband and I enjoy it (on warm summer nights there isn't much better fun than a close game of baseball and a cold beer.) The stadium is only a short drive from us, and we often take public transportation since the stadium has its own BART stop. Plus every Friday this season will be “Green Fridays” and fans our encouraged to wear green, along with the players who are sporting their throwback Kelly green uniforms. There are drink specials, and giveaways and even a few special Fireworks nights. To celebrate both the City of Oakland and our love of Oakland Baseball, I designed shirts for the whole family in the iconic Green and Gold of the A’s. My design features home plate, along with a baseball and pair of bats incorporated into the word “Oakland”. 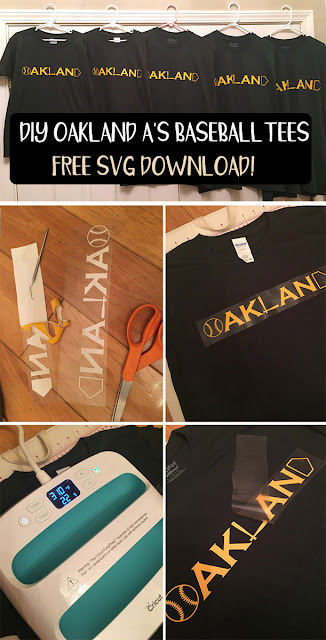 I have made the SVG file available for download so if you love Oakland too, you can make your own! If you are designing for the whole family the only thing you need to keep in mind is the size of the shirts. You can see how I had to scale up/down the designs since the shirt sizes ran from an adult XL to a child’s size 5. Weed out the extra vinyl, align it onto your shirts, press and remove the carrier plastic. You can see I was using my Cricut EasyPress for this. The shirts came out so cute.. perfect for an A’s game! While we were at the ballpark we made sure to visit some of the latest improvements to the stadium. Championship Plaza is the perfect pre-game tailgate alternative. If you don’t want the hassle of grilling or clean up, you can grab a bite from one of the many food trucks that gather before every game. And once you are in the park, you must visit the latest addition to the ballpark: The Treehouse. Overlooking left field, it is an amazing party deck with first come first served seating. When we were there they actually had a DJ playing music and it was a definite party atmosphere. There are game tables and plenty of seating, plus it features two full service bars. As a DIY and Home Blogger I could really appreciate all the reclaimed raw edge lumber used in the furniture. It definitely had that industrial yet comfortable Oakland vibe. I think my favorite thing about the Treehouse is the name itself. The team heartedly embraces Oakland’s city logo of the Oak Tree and the roots it has put down here. How better to observe your home town team, then from a treehouse? I love how unabashedly the Athletic's organization loves its home town. The Bay Area may have more than one Major League Baseball team to choose from, but our family’s hearts will always be Rooted In Oakland! Thank you to the Oakland Athletics who provided tickets and compensation for this post! Go A's! What a great idea, the shirts are awesome! You may have a new side hustle. We have a minor league team, the Charleston RiverDogs, here and have great memories of taking the kids to see them play. Your idea is very interesting to me. I love the shirts. Your family looks so happy. Thanks for all!! I'm so excited for baseball season. It's one of our favorite summer activities! This was such a fun read. I don't folow baseball but I think I'll research a little bit more. Happy 50 years to Oakland baseball team. I love the custom tees now you make me want to buy a Circuit so I can make my own tees!